Yesterday, our staff and 37 volunteers served hearty chicken stew with many side dishes to 130 guests, of whom 20 were new, at the drop-in community center. We all enjoyed a cool, sunny afternoon that followed a night of rain. Some of our guests shared stories of their cold, wet night on the streets, while others spent their limited resources on a motel stay. We encouraged many of them to take advantage of the winter shelter and come in from the cold winter nights. Nurse Anne and her assistants Anna and Gigi were on hand to talk to our clients about their various ailments and provide remedies and advice. When not at the drop-in center, nurse Anne and her volunteers are busy making sleeping mats and collecting donated toiletries, toothbrushes, socks and other useful items for our guests. Yesterday, nurse Anne also brought several new backpacks that were donated by a law firm, and each was filled with a blanket, socks, gloves and snacks. At the nurses’ station, guests were also given hand-knitted hats that were made by two volunteers and socks that were purchased by Temple Israel. Over a dozen clients came to ask for help with their shelter needs, transportation assistance and search for housing. We are following up with several clients this week to help them. Of special concern is a homeless family with a single mother and 4 children ages 11 to 13. We hope to help them to a more stable situation that will enable the children to do well in school and the mother to go back to work. A big shout out to Heather Chambers who has been our CPA and Payroll Administrator since UCO was incorporated over 11 years ago. 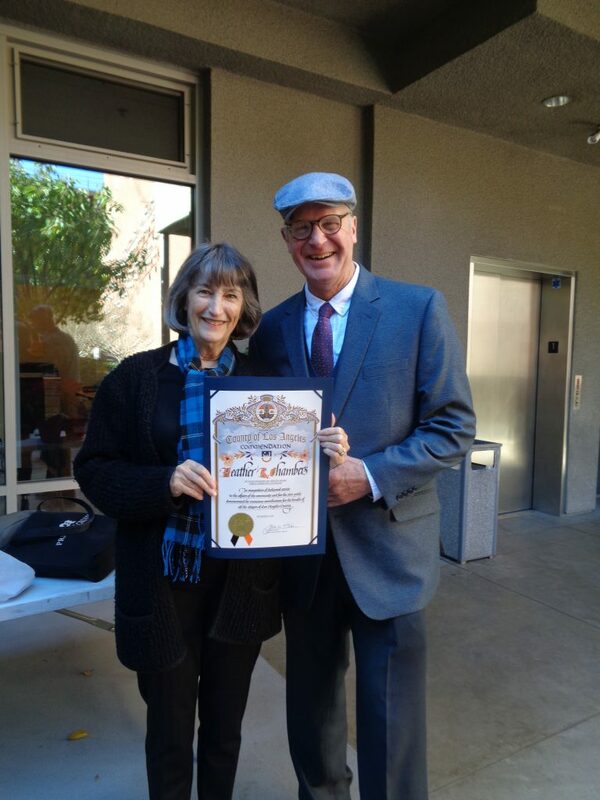 As shown in the photo, our Board Chair Doug Emslie recently presented Heather with a hand-written certificate from Supervisor Janice Hahn.